Qoya was founded by Rochelle Schieck in March 2009 in New York City. "People keep saying I should get out of my head and into my body - but how do I do that?" The first Qoya gatherings were classes, but after months of teaching, Rochelle was moved to offer a longer, deeper experience of Qoya in the form of a retreat, where the movement classes would be supported by ritual, pilgrimage, and community connection. In 2010, she began offering Qoya retreats, and since then, she and other Qoya teachers have led over 60 retreats all over the world. Enjoy this virtual tour of all the dances, rituals, pilgrimages, and memories of time we've spent gathered in community to remember our essence is wise, wild and free. There was a moment where we were in full expressive free dance, and it just seemed right to transition to dance in the pool! The first of MANY Costa Rica retreats! Our despacho! A prayer bundle where we blew our intentions into each item then burned in a fire our last night. We gathered at the beautiful Omega Retreat Center in Rhinebeck, New York. That time in India when we were on a Qoya retreat doing Alternate Nostril Breathing at sunrise in Madurai preparing for our pilgrimage to the largest Goddess temple to see where Shiva and Shakti were married and our adventure was starting to feel like The Darjeeling Limited Wes Anderson movie! This is one of our most favorite images of the magic that can happen on a Qoya Retreat. Our beloved sister Jamie Watkins was walking through the temple in Madurai, the place where Shiva and Shakti are said to have been married when she spontaneously started to dance with a group of children in the temple. Sacred Ceremonies. Our Lakshmi Puja in Kerala. On a boat in the backwaters of Kerala. Rochelle, preparing our prayer wheel. This was a beautiful Goddess Altar retreat at Menla Mountain Retreat Center in upstate New York. Athena temple at Delphi in Greece! On Friday night we did a despacho gratitude ceremony, called in the four directions and said thank you for the blessings in our lives. The next morning we went to the beach to do our morning meditation, breathing, labyrinths and beach dancing. As we finished, this man was about to lead a native American water blessing for the ocean and the mother goddess...mother earth. He invited us to join him. He saged us, marked our third eye and invited us to deeply remember our ancestors who cared for this land and lived attuned to its rhythms. He also called in the four directions and had us blow our prayers into our offerings, like we did the night before. The theme of this retreat was synchronicity and this moment was just one of many where the veil of illusion was lifted and the truth of interconnection was visible. Aho. The Amazon Jungle of Peru! This was a special New Year’s retreat to set our intentions for the year. Our first ever Qoya Collective Retreat in which several Qoya teachers co-led! Women brought their husbands, partners, boyfriends, and friends to dance with both masculine and feminine energy. We were blessed by an audience with the Dalai Lama! Whether you've never done Qoya before or attended 20 retreats, a Qoya Retreat is the best way to reconnect with your essence in a beautiful natural environment and circle of supportive women. 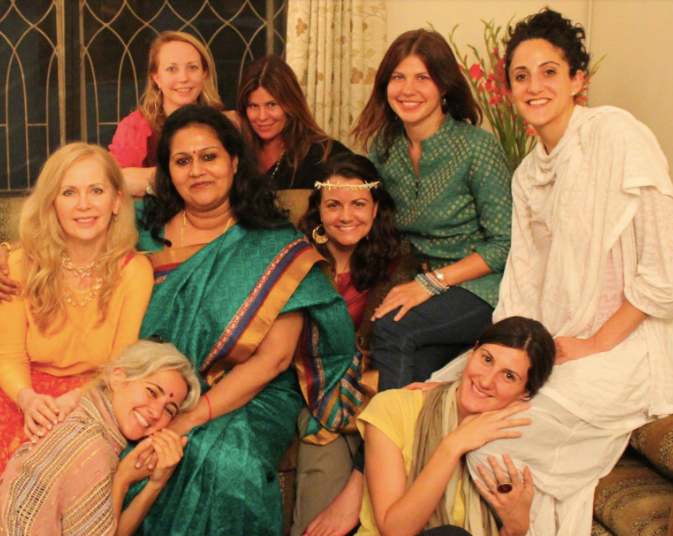 At every retreat, no matter what location, you will make a pilgrimage to a location with access to nature, get moving with daily Qoya classes, participate in rituals to cultivate deeper connection with the divine both within and outside of yourself, and spend time in a community of like-minded women who share your blessings and challenges and act as mirrors to reflect love back to you..
Save the dates for our official 10th anniversary celebration at the 2019 Qoya Collective Retreat in Costa Rica: March 23 - 30, 2019. Enrollment is opening soon! We also have Qoya retreats now open for enrollment with more being added all the time.